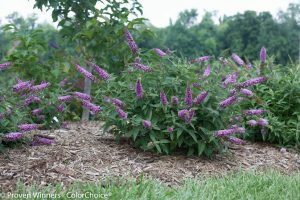 A whole new color for the Lo & Behold series, this pink butterfly bush is compact with an abundance of tiny fragrant blooms. It flowers continuously, is drought tolerant, deer resistant, and attracts butterflies all season. Grows in full sun, 18-24 inches tall and wide. ‘Blue Chip Jr.’ is slightly larger with blue flowers. Want More? Try the First Editions series with retro names like ‘Groovy Grape’, ‘Funky Fuchsia’ and ‘Psychedelic Sky’. Longing for a crape myrtle, but don’t have a lot of room? 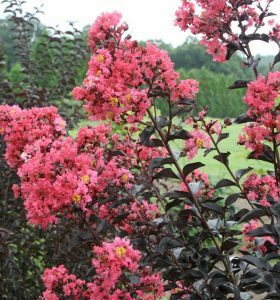 This Lagerstroemia indica is a compact option. 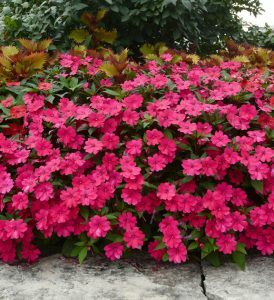 Its rounded shrub form sports superb purple-maroon foliage (that holds its color through the summer heat of the South) and abundant dark pink flowers that begin blooming in July and remain colorful into September. Grows in full sun, 4 to 6 feet tall and wide. Want More? Try the ‘Princess’ mounding dwarf varieties or the repeat bloomer ‘Purple Magic’. Grow this as an annual since it’s a little too cold here for a consistent year-after-year return. But it’s worth it. This is a stunning plant. 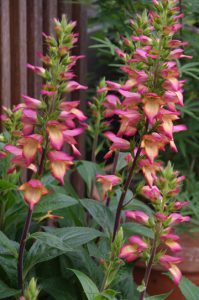 A cross between Digitalis purpurea (foxglove) and Isoplexis canariensis (Canary Island foxglove) brings the best of both plants. A fast grower with blooms spring to fall, plant Digiplexis in well-drained soil and avoid overhead irrigation. Grows 36 inches tall in full sun to part shade. ‘Flame’ has bright, pinkish to reddish-orange tubular flowers with yellow throats. Its sister plant, ‘Apricot’, hits the garden centers later this summer. 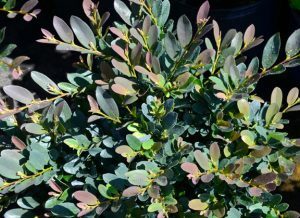 This Distylium is a mid-sized spreading, rounded evergreen with coppery-red new foliage that matures to blue-green. It tolerates drought, heat, wet soil (though it prefers well-drained soil) and has exceptional resistance to disease and insects. Petite red flowers appear in winter. Grows 3 to 4 feet tall and 4 to 5 feet wide in full sun to part shade. 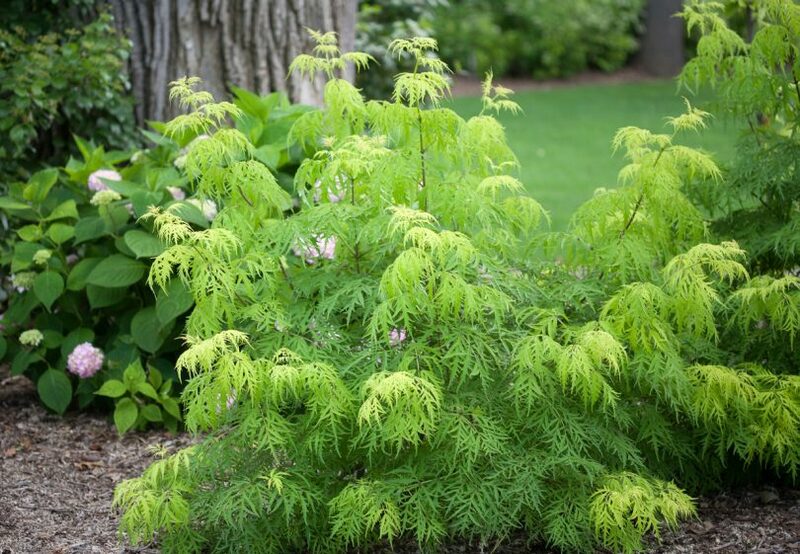 The lacy leaves of this Sambucus racemosa add a striking chartreuse color and a touch of whimsy to the garden. The red berries in fall attract birds to this no-fuss deciduous shrub, which is also deer-resistant. Plant it in part shade here. Grows 3 to 5 feet tall and wide. Want More? Try more lemon-colored plants like Illicium ‘Florida Sunshine’, Ligustrum ‘Sunshine’, Abellia ‘Lemon Zest’ and the Sedum ‘Lemonjade’. This is the first H. macrophylla to show blue and pink blooms on the same plant without adding aluminum sulfate or special fertilizer. It reblooms throughout the season with great flower power. Want More? 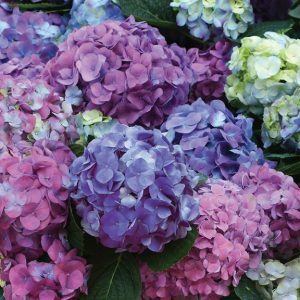 The options for hydrangeas seem endless this year: ‘Invincibelle Spirit II’, ‘Bobo’, ‘Little Quick Fire’, Hokomano’ (part of the Everlasting series), and the Oakleaf hydrangea ‘Munchkin’ from U.S. National Arboretum. Watch for ‘Pistachio’ later this summer. These impatiens look like Impatiens walleriana in habit, flower form and count, but are completely downy mildew resistant. Caring for this impatiens is easy: just add water and they’ll “bounce” right back. This annual works best in shade. Its mounding, spreading form grows 10 to 24 inches tall. The color ‘Pink Flame’ is a 2015 All-America Selections winner. Want More? Try Mukgenia ‘Nova Flame’ that marries the fringed leaves of Mukdenia with the durability of Bergenia to provide shade garden color in both its foliage and pink flowers in spring. Japanese Snowbell ‘Marleys Pink Parasol’ / John Lewis/JLPN, Inc. 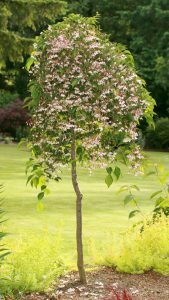 This narrow form of the weeping Styrax japonica is a stunning focal point and perfect for small gardens and large patio containers. True pink flowers with a light, cotton candy fragrance cover it in bloom, and the leaves turn a bright lemon yellow in fall. Grows 8 to 10 feet tall and 4 to 5 feet wide in full sun. One of the hardiest and easiest lavenders to grow, this Lavandula x intermedia has remarkable resistance to heat and humidity, even in the South. 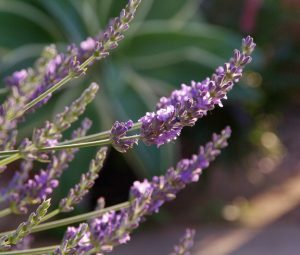 Its bright silver foliage and purple blooms are strongly fragrant. Lavender must be grown in full sun to produce flowers. Plant these in hot, dry areas where nothing else seems to grow. Good drainage, especially in winter, is essential for preventing crown rot. Grows 2-3 feet tall and 2 feet wide. Want More? Update your lavender collection with the award winner ‘Platinum Blonde’, a variegated form with strongly fragrant, lavender blue flowers. 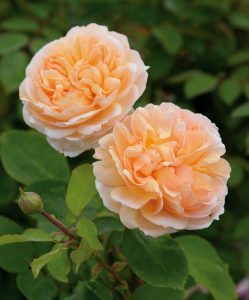 This is an intensely fragrant, apricot-colored rose that’s astoundingly floriferous, nearly burying itself in perfume and flowers from early summer to frost. The large roses are a rich pure apricot color that initially pales towards the outside of the bloom, eventually becoming cream all over. Its tea rose fragrance with hints of cedar wood and vanilla is strong and lovely. Expand your edible options with dozens of new varieties, including ‘Patio Pinot’ dwarf grape, Kalettes (a cross of kale and Brussels sprouts) and the unusual ‘Ketchup & Fries’ that features tomatoes and potatoes growing together on the same plant. It’s hard to know which local independent garden centers will be selling these plants, but you can always ask them to order these for you or you can search for them online.